diGenova discusses Grand Jury taking testimony on Strzok, Page, McCabe & others (Comey) involved in coup vs @POTUS. James Baker turned State’s evidence & fully cooperating w/IG & Fed Grand Jury. Comey knows he’s screwed. Ever wonder how that’s possible?
. @JayWebberNJ is running for Congress in the 11th District of New Jersey. He is outstanding in every way. Strong on Borders, loves our Military and our Vets. Big Crime fighter. Jay has my Full and Total Endorsement! Anon incorrectly noted 10 min delta btwn Q drop & DJT tweet. Was looking at wrong tweet. @realDonaldTrump 1st tweet in 4 hrs came less than 1 min (28 sec to be exact) after Q drop (re: Baker). Happens often. Shows connectivity/coordination btwn DJT & Q.
Anon replied to previous Q drop (re: DJT tweeting in coordination w/Q drops) by posting analytics graphic showing correlation in quantity of @realDonaldTrump tweets vs Q drops. #Anon submits and #AnalyticsGraph which #Q then reposts. Anon posted transcript of diGenova discussing plot to exonerate HRC & frame DJT. Grand jury taking testimony about Strzok, Page, McCabe, etc. Confirmed Baker cooperating. Q posted Baker testifying vs Comey on 11 Sep. Huber, Horowitz & Storch > grand jury. Future proves past. From the previous #Youtube video. #JamesComey knows he is going to be #Indicted & found #Guilty, hence his recent #MtRushmore #Tweet. If you didn’t know, #Comey frequently works his messages to convey his malicious subtexts & intents in a manor not seen by most. Inthis #Tweet #JamesComey is at #Rushmore, standing so that #Lincoln is behind him. #Q states “Correct, Anon.” This to a statement about the #QProof being 28 seconds before the #POTUS #Tweet. Sorry. At this moment it’s just not visible to me 12:41:42 ==> 13:41:42 ==> 1:41:42 PM & 1:39 PM ==> seems to be more than 28 seconds. Public interest in the TRUTH very apparent based on last night’s overwhelming response to the Q&A session. 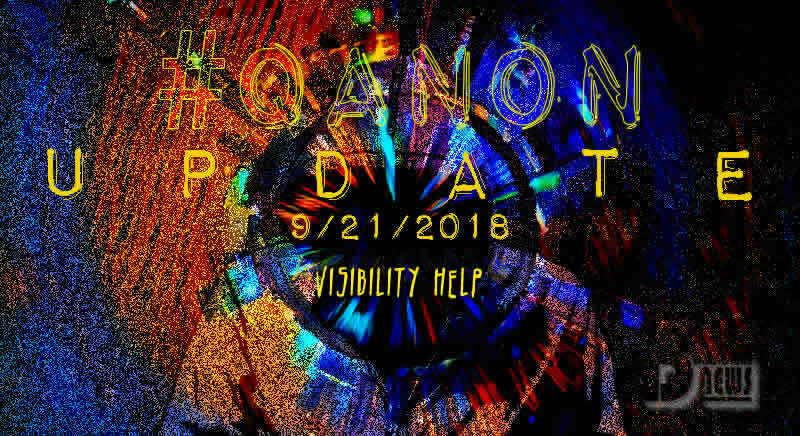 Q chose to use the chans to freely & anonymously lead anons/autists to the truth (uncensored) using questions that prompt research of open source info MSM won’t report. This is the #GreatAwakening & the forward momentum of awareness cannot be culled. Anyway this ties back to the #POTUS #Tweet about #JayWebber & shows the correlation between the two; hence #QProof. Imagine the frustration if we weren’t here communicating w/ you. This amazing Q op started almost 11 months ago. Many anons express frustration with lack of arrests. Imagine how we’d feel if Q team wasn’t sharing all they’ve shared with us (2236 drops as of today). We’d all still be in the dark. MILLIONS have been awakened thanks to Q.
Anon’s son joining the USMC. Love when Q takes the time to show appreciation! Yesterday during Q&A, anon asked re: significance of pushing back date of EBS Presidential Alert test. Q said it is linked to Kavanaugh confirmation. Nunes recording re: [RR] impeachment would impact Kavanaugh confirmation. K confirmation priority #1. I love this so much…and I love that God saw fit for us all to be a part of this phenomenal movement/operation to help wake up our fellow Americans & freedom lovers around the world! What a time to be alive!! New emails show there was not enough intel to support the Jan ’17 findings by the #CIA. Those in attendance – be vigilant tonight. Consensus appears to be @realDonaldTrump was making a heart (not a Q) with his hands after pointing at “VIP Patriot”, @ColinSkow, who was sitting in the front row wearing a “Keep Calm and QAnon” tee shirt. Makes more sense! Awesome! Kudos to @michaelbeatty3 who JUST sent this to me via DM and I RT’ed it before I saw Q posted it 2 min earlier! Another shout out to VIP Patriot! An original picture of the Fountains of Bellagio in Las Vegas! Reverse image search found no other copies. So, we know @realDonaldTrump is staying at his own hotel. Could the pic of the Fountains of Bellagio have been pulled from a bad actor’s phone? It was definitely taken from the Bellagio Hotel. Found this pic of the Fountains view fm Penthouse Suite. This entry was posted in Uncategorized and tagged Disclosure News Italia, love, QAnon, Sept. 21. Bookmark the permalink.